When it comes time to fill-up the gas tank, my go-to credit card is the Scotia Momentum Visa Infinite. That’s because this card pays 4 percent cash back on gas purchases – more than any other rewards card on the market. Related: Scotia’s Free $100 Gift Card Promo is Back! But I’m also on the lookout for the best deal on gas prices. 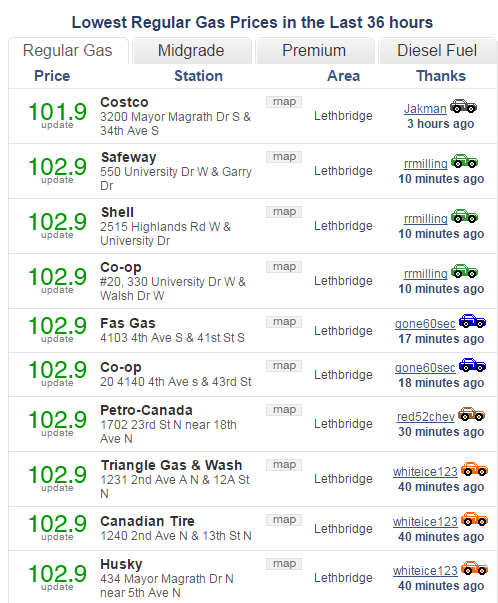 Costco gas bars are usually the cheapest in town by about 5 cents per litre. However, Costco isn’t an ideal location for me – it’s all the way across town – plus the wholesale giant only accepts MasterCard, so using the Momentum Visa was out of the question. That means I never get to have my cake and eat it too. All of this changed when a Co-op gas bar opened up in a convenient location nearby. Retail co-operatives serve more than 500 communities and more than 1.6 million active co-op members across Western Canada. A lifetime membership cost just $10 for a share in the local business. At the end of the year, members get cash back in proportion to the amount they’ve spent at the store. The cash back that members earned from gas purchases last year worked out to 7.5 percent – or 8.5 cents per litre. My rewards are boosted even further by using the Scotia Momentum Visa Infinite every time I fill-up at the Co-op gas bar. Other programs, such as Canadian Tire, Safeway, and Costco, all come with certain ‘gotchas’ that limit the program’s effectiveness and convenience for customers. Canadian Tire pays you in its own currency, Safeway only offers fuel rewards when you purchase a certain amount worth of groceries, and Costco only serves members and is limited to MasterCard customers. With Co-op, I’ve found a way to optimize my gas spending by combining a great cash back discount with my already best-in-market cash back credit card. The best part is that it’s easy to use – just enter my Co-op number each time I gas-up the car – and the gas bar is in a convenient location between my home and work. The drop in gas prices over the past year has put some money back into the hands of consumers. By getting an extra 11.5 percent cash back on gas purchases, I’m cashing in even more today while also hedging against the next big price increase at the pump. Hey, that’s great, nice strategy! I just applied for the Momentum and am waiting for it to arrive. Meanwhile, I will be collecting tips like this.